On the 102nd anniversary of the capturing of Vimy Ridge during the First World War, architectural historian Jacqueline Hucker explores the battle and its aftermath. Rising from Vimy Ridge in northern France, its twin pylons silhouetted against the sky, the Vimy monument is Canada’s national memorial, commemorating all who took part in the First World War. Its placing marks the capture of the ridge by the Canadian Corps between April 9 and 12, 1917. It honours the memory of the 65,000 Canadians who lost their lives in that war. Carved across its great walls are the names of 11,285 Canadians who died in France and whose bodies were never found. Canada’s entry into the conflict followed automatically on Britain’s declaration of war on Germany on Aug. 4, 1914. At that time, Canada, a country of eight million people, had a standing army of 3,000 servicemen, supplemented by a part-time militia. By the end of the First World War, a massive militarization saw 630,000 Canadian men and women in uniform. The country’s most distinguished contribution to the war effort came through the Canadian Corps, a force of some 100,000 soldiers, sent to northern France to fight along the Western Front. 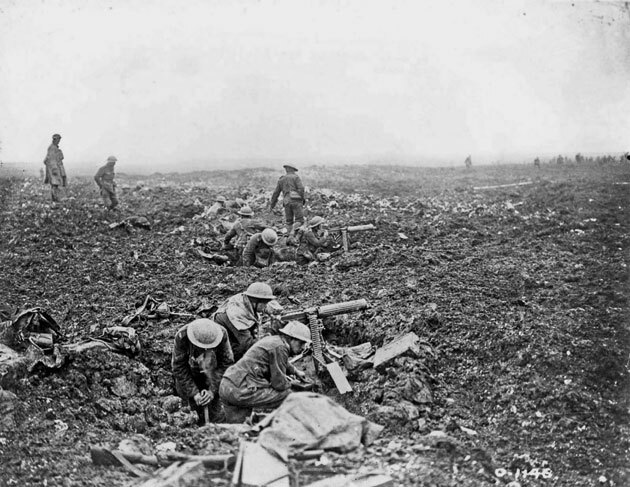 Its capture of the seemingly impregnable Vimy Ridge was one of several significant Canadian military engagements in the war but assumed a special place in the country’s history. The victory marked the first time all four Canadians divisions launched a simultaneous attack on one front under Canadian command. Four Canadians won the Military Cross at Vimy Ridge, and the Corps went on to earn renown for its innovative methods and courage. Canadian machine gunners at Vimy Ridge, April 1917. Victory came at a high cost, however. At the end of the four-day battle, Canada’s force had suffered 10,602 casualties, including 3,598 deaths, making it the most intense and costliest victory in Canadian military history. Nonetheless, the successful outcome of the hard-fought attack, which was widely reported at home, boosted the country’s military confidence. The combination of military success and national sacrifice served to reinforce Canada’s awakening sense of independence. The striking monument was designed by Walter Allward, a Toronto sculptor. Construction began in 1925, the monument unveiled in 1936. It is a modern retelling of a Greek drama. Its pylons symbolize the two forces—Canada and France—that had fought on Vimy Ridge. Its larger-than-life figures symbolize both victory and sacrifice and speak to the ideals for which Canadians had fought. The isolated figure on the monument’s front wall represents Canada Bereft, forever mourning her dead. The battle landscape on which the monument sits forms an important component of the memorial. After the war, France granted Canada 100 hectares along the ridge in perpetuity to enable the creation of a memorial park. Within its boundaries runs a significant length of the Canadian and German front lines, with tunnel systems as they existed in April 1917, and two cemeteries created after the war by the Commonwealth War Graves Commission. The timeless nature of the Vimy Monument forces us to confront the immeasurable cost of that war and of all wars. A version of this article appeared in the April 2017 issue with the headline, “Monumental Honour,” p. 86-87.